This is one responsive WordPress theme well worth the wait. You’ve heard us mention it within our community forums and now it’s ready for your next newspaper or magazine site. This is no ordinary theme! As always, we listened closely to our community and analyzed the most requested features. Even with our 5 years of newspaper design and development experience, it took our developer 2 months to perfect all (and there’s definitely a long list) the features of this theme. We’ll go into details further below, but rest assured you won’t find another theme that compares to the all new Patterns theme for WordPress. We know the importance of responsive design and for that reason we designed Patterns to work with larger screens as well as tablets and smart phones. Try it out yourself! Take a look at the demo of Patterns theme and resize your browser to test its responsiveness at different sizes. Twitter Bootstrap is one of the most popular frameworks for designing responsive websites built by the nice folks over at Twitter. It’s now widely used, and we’ve adopted it for our own purposes. Due to its solid code library, ease of use, and wide acceptance, our themes will be built on this framework going forward. Satisfying multiple requests from early users, a news ticker located at the upper left side of screen can display the latest posts – or – posts of a specific category or tag. It’s the perfect section for breaking news or sticky topics. Patterns is our first theme that comes without a slider on the front page. However, we designed something better for you – a neat featured collage are that displays posts based on a user-defined category or tag. 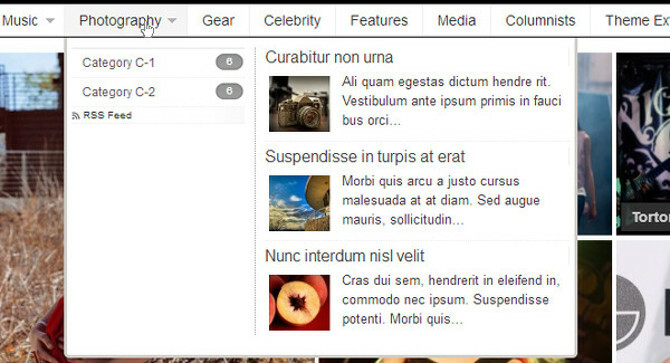 Want more than just basic drop-down navigation menus from a premium theme? You can take advantage of Smart Navigation designed not only to provide easy navigation across your site, but also to encourage visitors to stay on your site longer. The Smart Navigation is a two-column panel divided into sub-navigation items and the most recent entries within that category. Blog layouts are boring! We work with some large and interesting clients in the online news world and they all have unique layouts for categories, and now you can too. We introduced the concept of custom inner page layouts with City Desk and carried that feature into every theme thereafter. Patterns received some special attention with several category layouts to choose from so you don’t have to display all your categories / tags / author archives in the classic blog format. Take advantage of these unique magazine style layouts to give each category page some new life. If a sleek front-page isn’t enough, and multiple category layouts haven’t got you convinced, then how about the ability to choose from four different post layouts? Tell us what you think of this theme release in the comments below, or ask us a question. 79 Responses to "Patterns – A Responsive WordPress Theme for Online Magazines"
awesome theme mehmet, good luck with sales! Ciao anche io volevo fare i Complimenti per Patterns….meraviglioso! Infatto l’ho acquistato ieri. Però caro Mehmet ho avuto un problema. L’o installato e poi sostituito con uno già esistente, lato front end tutto ok…anche se dovevo completarlo, ma lato backend un grosso guaio…..non mi permettevapiù di entrare in wp-admin poichè mi generava errore 500. Potete aiutarmi a capire come mai? Io ho fatto gli stessi passaggi di sempre per sostituire un tema. Yes, looks really great. Can’t wait to use it for my next project. This is an absolutely stunning magazine WordPress theme! Well done. Thank you very much for your nice comment Jonathan. Great work, Mehmet – but I’m disappointed that Gabfire have produced their third magazine design in a row (a great one, admittedly). So I hope Gabfire’s next design will be a responsive newspaper. They’re a completely different beast from a magazine. And now that you’ve gotten on top of Twitter Bootstrap, I also hope you can get one out faster too. We want to move to an upgraded responsive design this year – but Logo Mag isn’t it. We use same term for Magazine and Newspaper themes and Patterns that we advertised here is certainly a fully responsive Newspaper theme. I’m agree with you david! i hope the next newspaper will be the best,especially for mobile!!! Good job with the new theme! I love it. Hi! What about COLUMNIST page and COLUMNIST on admin panel? Mehmet – I really like this theme. Great design, versatility and looks good. Yes, you can easily set blog layout as front page of your site. We can show you how to do that on support forums. Love the theme. I’m having a difficult time trying to get it to work on a multisite. Very, very nice magazine theme Mehmet, congrats! Especially all the images on the homepage look great. Thank you Michael. I appreciate the nice comment. hi, Mehmet the new theme it’s awesome. it ‘ a killer’s theme and I love it. I asked via mail for a printscreen of widget map, because we are talking about a new look for our magazine, but for us the priority is to have right positions for ads. How can I see widget positins of this new theme? I’m registered to the demo area, selected theme Pattern but the site it’s without contents, and, sorry, to see widget area theme will be customized ( I think…) because I’ve tried and no widget zones are shown. Great theme but disappointed there are no full size leaderboard banners adverts available to place in the backend. Am I being blind? Actually there are via widgets. You can use Widget zones to add full width banners. Ask on forums and we will guide you Mc. Is there a workiing demo with 728×90 banners? It’s hard to imagine where will they fit in the layout. Does this come with a PSD file? Im not keen on the top middle image of tesselating patterns. Is thiis easy to remove/replace? Have tried googling your FAQs but its not listed. Thanks. is it possible, to show a latest Posts Section with Pagination on Homepage? Because even in Magazines, Readers like to see quick and easy the latest Posts. @mak – Sure thing. You can simply use 1 of 2 widgets to display the recent posts, as well as the make the collage area display recent posts. I love some of the themes but really need to know if my site will get populated automatically with news feed from selected sources…not sure how that works. Is it an option here? Looking to buy a theme today! You can populate with news feed but will need a plugin to do that. You’ll need to configure the plugin settings to work with the theme, however we do have users that run their sites in similar way. Thanks for the wonderful comment R.Boldini! Happy to hear such things. Seems like we’ve delivered. Are you familiar at all with this problem? Hi JR – Simply fill up your site with more content. It will correct itself once you have more posts on the site. How does the “Recent videos” block work? Does it show videos from some youtube channel, or does it show videos added into the recent posts? Is there an option not to use the left sidebar in the classical blog format? I would like my blog to have the following format on all the pages including the mainpage: http://demos.gabfirethemes.com/patterns/testing-the-elements/default-template/. Is it possible? We could help you with that on our support forum. It’s not designed that way out-of-the-box, but we’ll give you some hack to have that as default page. It shows the videos from a specific category’s posts. clear and simple wordpress news theme, good luck with sales. Well, thats a nice theme indeed. Seems it will suit for movie related Blog/Newssite. I have just tested the theme at playground.gabfirelabs.com. I did not think it was so easy to manage ). However, there is another thing that worries me. As far as i understand, the theme creates thumbnails for the uploaded photos automatically. I have counted at least 10 different thumbnail sizes. Does it mean that each uploaded photo will have 10 thumbnails? I am going to upload 3-10 photos per each post; so, will each post have 30-100 thumbnails? That’s crazy, ’cause it will take too much hosting disk space. Am i wrong? Not really. The theme comes with built-in support for TimThumb thumbnail script which generates only 1 thumbnail for every section on fly. So, the thumbnails are generated as less as possible. What about related posts possibility? I love how modern this theme is. Newspaper design at a more efficient and eye-catching level. Good one, guys! What version of Twitter Bootstrap is Patterns built on? Along the same lines, is there anyway to upgrade Twitter Bootstrap (as new versions become available) after implementing the theme? Its build on latest 2.3.1 version. And we have a very simple guideline that points out how to update Bootstrap. Thanks so much for the info. One more question — what browsers is the Patterns theme designed to be compatible with? Hi! I have just bought this theme. Unfortunatelly, I can not find comment reply link. What do you say? @sss – Feel free to post a thread on the support forum, and we’ll get you sorted. Though, first make sure your WP Settings > Discussion allow for such threaded replies. Thanks. I really like this theme, but I’m presuming everyone magazine site and his dog will use it to death and I really feel it should have had some customisation ability of the background tiles (triangular design) as someone has already mentioned. They asked if the PSD file came with the theme but there was no response. I’m creating a magazine website and must be able to brand it, can you please advise if PSD is available or if it is easy to customise the background template used down the central column without too much hassle. Unfortunately we do not have a PSD for Patterns. This theme was designed old-school, just with notepad. To add a background and to change the header/footer items are very easy thou. You can create any kind of image and ask us at our support forums how to add them to your site’s background or to header of site. Brave move given the current state of the market not to include a home page slider, but I think the collage looks great! It’s good to be different, right? Not sure you saw my followup question above … what browsers is the Patterns theme designed to be compatible with? I’m only asking this question here because I’m having issues getting the support forums to load. I will keep trying. I have several of the gabfirethemes – which I love. I just recently moved another site to a new host and had the choice to pick from your themes and chose the Patterns theme (love it!) my only question is in the demo it shows several possible widgets that can be used, but when the theme was loaded a lot of the gabfire widgets weren’t there. i.e. about, twitter feed, facebook, flickr and a few more. How can I take care of that? We have removed those widgets in favor of started plugin that we are going to release very soon. We will be releasing starter pack within next week where all these widgets will be added to your site as soon as you activate it. Thank you. Since I’ve already activated the site and using it – is there a place that I can get the update as soon as it comes out? The Collage doesn’t seem to appear on my site. would appreciate any tips. @drea – just ping us on the support forum and we’ll get you sorted. Be sure you have configured your Theme Options. 1. can i have different sidebars for different categories, pages, or posts? 2. can i put a toggle/accordian/faq function in the widgets? 3. is this theme compatible with the formidable pro plugin? one of the most amazing wordpress news blog theme and well done. This is nice magazine wordpress theme very well done especially the top collage to really make first impression to site visitors. Çok güzel olmuş, eline sağlık. Bu temayı çok beğendim, gerçekten etkileyici… Tebrikler..
Hi Mehmet, you helped me out with the theme eventmaster for the flyfair.nl website. I had posted another question, but i cant enter the forum anymore.. I log in at the dashboard, but when i wanna enter the forum, its not allowed. Now i cant see your answer and i dont have support any more. It was this subject: sliderbuttons on homepage dont work. Can you send me the answer? Your college says its problem at my end, what can i do? Please try a different browser and try again. Meanwhile, i will send you my answer shortly via email.